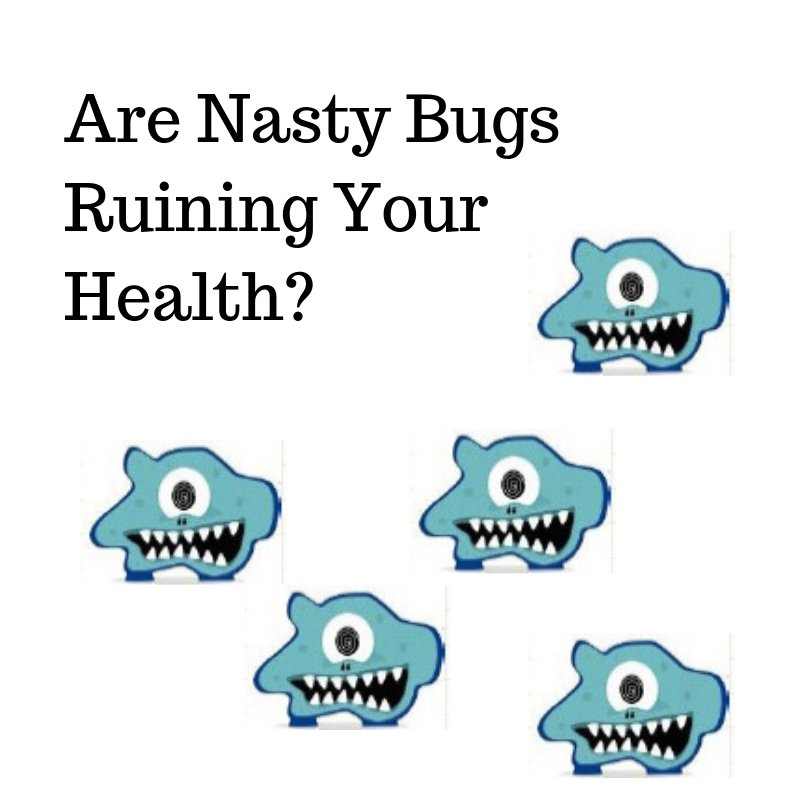 Home/acne, anxiety, Blog, constipation, Digestion, Digestive problems, headaches, Immunity, leaky gut/Are Nasty Bugs Ruining Your Health? Almost every single client who walks in our door needs some kind of rebalancing of their digestive tract. This is a foundation of good health. And yet when you think about the rows and rows of anti-diarrhea, anti-constipation, acid reflux, and other digestive related medications in every box store and pharmacy, you get a glimpse at how widespread digestive problems are in our culture and hence the rise of serious health conditions. Gut function is key to optimal health. Our topic today is SIBO or Small Intestinal Bacterial Overgrowth and its cousin, SIFO or Small Intestine Fungal Overgrowth. We have found this condition to be extremely common. We can identify it through symptoms and verify it through functional testing. Low stomach acid. Can be brought on by aging and eating when under stress, but most often by the use of over the counter acid-blocking medications such as Prilosec, Nexium and Zantac. You’ll know that you have low stomach acid if you bloat or have gas within two hours of eating a meal or experience belching and burping. Pancreatic or gall bladder dysfunction. These two glands help us digest food, especially fatty food. So if you have undigested food in your stool, pain under the right ribs after a fatty meal, or urgent light colored (yellowish) stools that float after a fatty meal, think gall bladder congestion and its associated tendency to develop SIBO/SIFO. Type II diabetes. Sugar feeds these unfriendly bacteria and yeast, so if your blood sugars run high, you are providing nourishment for these creatures and your tendency to grow pathogens increases. There are two types of SIBO. One tends to cause constipation and the other diarrhea. SIBO can be evaluated by urine testing (part of our TRIAD test) or via a breath test. Correcting SIBO/SIFO requires a multi-pronged approach that must include dietary changes, anti-microbial agents, digestive enzymes and probiotics. Many people use the antibiotic Xifaxin but almost always relapse as it is not enough to correct this very persistent condition. Let me tell you about a typical client that came with a laundry list of symptoms, not necessarily digestive, but upon testing we discovered SIBO was an underlying cause of her problems. Kathy is 32 years old was on medication for her skin (tetracycline), Xanax for anxiety, and Allegra for allergies. We discovered, through testing, that Kathy had SIBO as well as SIFO (overgrowth of unfriendly bacteria as well as overgrowth of yeast). She started taking an anti-fungal/antibacterial herbal combination supplement along with a high potency probiotic. We also provided liver support using a botanical combination of milk thistle, dandelion, beet powder and ox bile. Because the test also showed severe dairy and egg sensitivities, she removed these foods from her diet. I also recommended she eliminate sugar and white carbs such as bread, pasta, rice and white potatoes. Next, we added a multivitamin designed for blood sugar control to help her with energy and anxiety. Her program also included a calcium-magnesium supplement at bedtime to help her sleep more soundly and to relax her muscles. I also recommended she see a chiropractor to address her chronic neck pain. Neck pain about 50 % better, hadn’t been to the chiropractor yet. Complete clearing up of her sinuses except when she cheats and eats dairy. Kathy is well on her way to optimal health and is continuing her program. She no longer needs Xanax. I am confident that her skin will clear up over time (she has now stopped the tetracycline, which was causing her gut issues). She will also be able to stop using the Allegra as her liver and immunity improve. If you know someone like Kathy let them know about how BeWell can help them! We offer our Free 15-Minute Consultations, a good way to get started.